alkidiki or Chalkidiki is a three-pronged peninsula located south of Thessaloniki and is widely regarded as having some of the best beaches in Europe with soft sand, crystal waters and lush surroundings. The main peninsula terminates in three smaller ones, namely Kassandra, Sithonia and Athos, which is also known as the Holy Mountain or “Agion Oros”. The Kassandra peninsula is relatively easier to get to and thus it is more developed tourist-wise, combining popular beach sites during the day with a vibrant nightlife. The Sithonia peninsula is more quiet and contains hundreds of hidden coves to relax, which makes it also popular for camping.  Halkidiki can be easily accessed by car and bus, with regular bus schedules. The main road to Halkidiki goes through the east-end of the city, where Thessaloniki’s international airport is conveniently located. Highlight: Village Athitos in Kassandra is one of the most traditional villages and offers some spectacular views over the Toronaic golf and the Sithonia peninsula. ounded by King Perdikas in the 7th century BC, Vergina was the first capital of Macedonia, known in ancient times as Aigai. In 336 BC, King Philip II was assassinated there by one of his seven bodyguards while attending the wedding of his daughter Cleopatra in the theatre. Alexander III would become his successor. Nearby is Pella, the second capital of Macedonia from the 5th century onwards, where Alexander the Great was born. The palace has been excavated, as well as the theatre, and the site also features hundreds of burial mounds across the plain, some dating from the Iron Age. The tomb of Philip II was found here undisturbed in 1977, full of treasures that are now on display at the local museum. The museum contains superb artefacts and has a unique structure in that it has been built in a way that protects the tombs and shows the tumulus as it was before the excavations. The tomb of Phillip II contained a marble sarcophagus, inside of which layed the larnax made of 24 carat gold and weighing 11 kilograms. Highlight: The architectural setting of the museum, which is built inside a tumulus. Towering above ancient Dion, Mount Olympus is Greece’s highest mountain and home to the Gods of Greek mythology. The mountain is rich in tree and plant life, supporting more than 1,700 species, some of which are very rare. In 1938 it became the first National Park of Greece, and in 1981 a World’s Biosphere Reserve. Organized mountain refuges and various mountaineering and climbing routes are available to visitors who wish to explore its nature. The main village in the area is Litochoro, which is well connected to Thessaloniki by bus and train. Without experience or using special equipment, it is possible to climb the highest peak in about two days, along numerous mountain trails. Zeus, the “Father of Gods and men” who rules the Olympians according to the ancient Greek religion, was honored at the ancient city of Dion located at the foot of Mount Olympus. The site of ancient Dion itself was an important religious sanctuary, frequented by Philip II and Alexander the Great. The first mention of Dion in history comes from Thucydides, and according to Diodorus Siculus it was Archelaus I who gave the city and its sanctuary their subsequent profound importance at the end of the 5th century BC, by instituting a nine-day festival that included drama and athletic competitions in honor of Zeus and the Muses. Highlight: Some of the most beautiful wildflowers in Greece are native to Olympus’ meadows, including 23 varieties that cannot be found anywhere else in the world. In the region of Naoussa there are important Macedonian graves and in close proximity one can find ancient Mieza and Aristotles’ School. Mieza was, in antiquity, one of the most important cities in Macedonia. The Sanctuary of the Nymphs lies in a magnificent landscape, rich in water and vegetation. Shortly after the middle of the 4th century B.C., the whole area was properly arranged to house the School where the famous philosopher Aristotle gave lessons of Philosophy, Arts and Mathematics. Young Alexander the Great was one of Aristotle’s students and resided there for two years. A portico-type building in the ionic order has been discovered, and has been identified as the “peripatos” of the philosophical school. Recent excavations have brought to light the ancient theatre of Mieza ( 2nd century BC), many graves in organized cemeteries, ancient baths and superb artefacts. Highlight: The idyllic landscape, full of vegetation and riverbank trails among cool streams of water with nearby springs as their source. The secretive “Shangri-La” is located on a rugged promontory south east of Thessaloniki, where it is possible to step back in time and mingle with hundreds of monks, from more than 20 monasteries, in one of the most scenic spots in Europe. Only males are permitted to enter Mount Athos, although females can still enjoy boat tours with fantastic views over the sea and the monasteries. This unique mountainous enclave on the coast is sprinkled with huge monasteries, most resembling castles, containing wonderful frescoes, mosaics and libraries. There are also smaller monasteries known as kelions attached to small churches, as well as caves on the mountain slopes where monks retreat as hermits. There are forests, pristine seashores and beautiful gardens cared for by the monks. Mount Athos is a self-governing area within Greece. The number of daily visitors to Mount Athos is restricted, and all are required to obtain a special entrance permit valid for a limited period. Highlight: Huge collections of invaluable medieval art treasures can be viewed in many of the monasteries. The Petralona Cave was discovered in 1959 by a local shepherd looking for a spring. The “Petralona skull”, which was found in 1960, is dated to more than 700,000 years old and is extremely well preserved, making it the oldest human europeoid (presenting European traits) of that age ever discovered in Europe. It has been named as Archanthropus Europaeus Petraloniensis. Further research in the cave has yielded two pre-human skeletons, which are about 800,000 years old, as well as a large number of fossils that belong to various species, and traces of fire which are the oldest known to this date. Highlight: Learning about Europe’s oldest person. hilippi, a city with profound strategic importance during the ancient times, was established by King Philip II in 356 BC on the site of the Thasian colony of Credines “Fountains”, near the head of the Aegean Sea and about 18 kilometers north-west of Kavala, the modern-day principal seaport of eastern Macedonia. 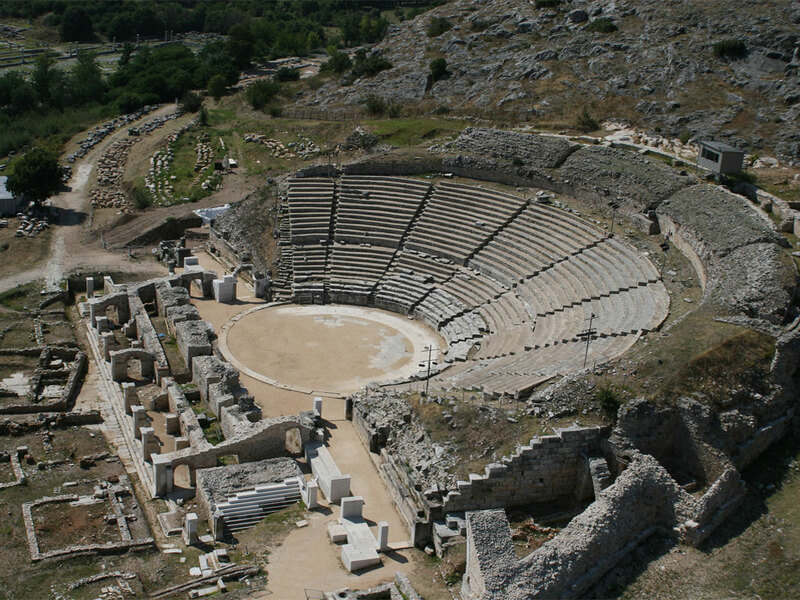 The ancient theatre of Philippi is a remarkable monument, hosting the renowned Philippi Festival, and still preserves many of its original elements. The excavations have brought to light ruins from the Hellenistic, Roman and Byzantine periods. The octagon, the Roman forum, the Paleochristian basilicas and parts of the city walls are some of the most well known. Philippi is also the site of the famous and final battle in the Wars of the Second Triumvirate, where the army of Mark Antony and Octavian (of the Second Triumvirate) defeated the forces of Julius Caesar’s assassins; Brutus and Cassius committed suicide thereafter and the victors spent a fortune on Philippi, granting it the status of Roman Colony, and providing impressive ruins and artefacts which are on display nowadays at the local museum. In the year 49 Apostle Paul came to preach to the inhabitants of Philippi, which became the first European city to accept Christianity. Highlight: The Philippi festival, which runs throughout the summer. eteora (Greek: “middle of the sky”, or “suspended in the air”) — etymologically related to Meteorite — is one of the largest and most important complexes of Greek Orthodox monasteries in Greece, second only to Mount Athos. The six monasteries are built on natural sandstone rock pillars, at the northwestern edge of the Plain of Thessaly near the Pineios river and Pindus Mountains. The Meteora is included in the UNESCO Heritage List. There is a large variety of outdoor activities one can pursue, including beautiful hikes and rock climbing. Highlight: Climb to Varlaam Monastery to enjoy the amazing panoramic view of the Grand Meteoron, the Thessalian plain, and the Pindos Ranges.